This item is made using white soy sauce and domestically produced dashi soup stock ingredients and has an elegant, gentle flavor. Can be used in making suimono, kaketsuyu, stews, or hot pot dishes. Domestically produced dashi soup stock ingredients are used luxuriously in making this item, along with refreshingly delicious white soy sauce. Seasonings can be a crucial part of a meal, turning plain food into a delicious experience. After all, sometimes we only think we don’t like certain foods because we haven’t tried them with the right seasoning! Sugarlady’s white dashi soup stock and other seasoning products are safe and free of chemical seasonings and additives, letting the true, natural flavors of the ingredients themselves shine – and allowing you to enjoy your meal without worry. 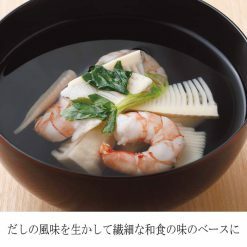 Combine the dashi soup stock with water or hot water in the following ratios:Suimono (clear broth soup) 1:15.Soup with noodles (kaketsuyu) 1:10.Stews 1:9.Oden or yosenabe hot pot 1:14.Please adjust these ratios according to your preferences.To make oden, stew whole items such as boiled eggs, fish cakes, and vegetables in your hot pot along with seasonings and the diluted broth. 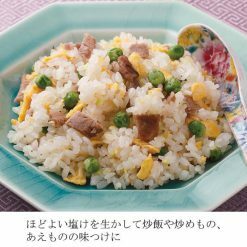 To make yosenabe, simply cook ingredients of your choice (everything from vegetables to eggs and meats) together in your hot pot along with seasonings and the diluted broth.After opening, be sure to close the lid, store upright in the refrigerator (below 10℃), and use as soon as possible. The dashi soup stock ingredients in this item may settle or become darker in color, but this will not negatively impact their quality. 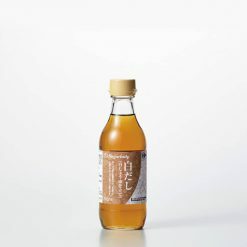 This product contains white soy sauce, fermented seasoning, table salt, sugar, hon-mirin, katsuobushi, katsuobushi extract, kombu seaweed extract, Yesso scallop extract, sodagatsuobushi, yeast extract, muroaji(mackerel scad)bushi (powder), shiitake mushroom extract powder, (this product contains wheat)..